During June 2000 a burial cave was excavated in Jatt (Permit No. A-3246*; map ref. NIG 20451/70048; OIG 15451/20048) after it was severely damaged when the area was being prepared for construction. The excavation, on behalf of the Antiquities Authority, was directed by K. Sa‘id, with the assistance of A. Hajian (surveying), N. Zak (drafting), T. Sagiv (studio photography), M. Shuiskaya-Arnov (pottery drawing), A. Cohen-Weinberger (petrography), Y. Mizrachi (scarab), E. Yannai (guidance), D. Barshad, M. Masarwa and Z. Horovich. The cave was hewn in chalk bedrock at the northeastern slope of Tel Jatt (Fig. 1; ‘Atiqot 37). Due to the severe damage only part of the cave was preserved (1.9 × 2.0 m) and it was impossible to reconstruct its original plan. Below alluvium that contained fragments of pottery vessels from the Byzantine period was a stone collapse that belonged to the buildings outside the cave. The layer below the collapse contained an amphoriskos from the Early Bronze Age IV and bowls, jars, jugs, juglets, imported vessels and a scarab, dating to Middle Bronze Age IIB. A small number of human bones from the cave were taken by representatives of the Ministry for Religious Affairs. Hence, no anthropological details regarding the deceased could be obtained. The bowls of MB IIB are open and carinated. The open bowls include a shallow bowl with a pointed rim (Fig. 2:2); shallow bowls with a cut rim (Fig. 2: 3, 4); bowls with an outward rim (Fig. 2:5); a shallow bowl with a rounded rim (Fig. 2:6), deep bowls (Fig. 2:7–10); a bowl with a slightly curved wall and inverted rounded rim (Fig. 2:11) and a deep bowl (Fig. 2:12). The carinated bowls included a large (Fig. 2:13); medium (Fig. 2:14) and small (Fig 2:15) rim diameters and a medium-sized diameter bowl with a rounded carination (Fig. 2:16). Two jars were discovered, one with a shoulder handle (Fig. 3:1) and the other––handleless (Fig. 3:2). The jugs and juglets are divided into local and imported vessels. The locally produced jugs and juglets include jugs with a spherical body (Fig. 3:3, 4); three piriform juglets (Fig. 3:5–7), one of which is red slipped and vertically burnished; an ellipsoid juglet (Fig. 3:8) and five dipper juglets (Fig. 3:9–13), two are large and three––small. Some of the jugs and juglets were produced from a non-indigenous fabric. Petrographic analysis revealed they were manufactured on the Lebanese coast and in the Nile region. The jug decorated with black paint (Fig. 3:14) was probably produced in the northern Lebanese coast, possibly in the region of Tell ‘Arqa. The piriform juglets (Fig. 3:15, 16) are similar to the locally produced ones, but their fabric and the quality of finish is better and they too were apparently manufactured on the Lebanese coast. The Tell el-Yehudiyeh juglet (Fig. 3:17), relating to the Piriform 2 type according to Kaplan's classification (Kaplan M. 1980. The Origin and Distribution of Tell el-Yahudiyeh Ware. Göteborg), is made of dark gray clay with a black surface. The body is divided into six vertical segments from the neck to the base, three of them are punctured and between them are three narrow burnished zones. The burnished areas extend from the base all the way to the rim. The punctured motif used an eight-tooth comb and no evidence of lime filling was preserved in the pricked dots. The petrographic analysis showed that the juglet originated in the Nile Valley. The dipper juglet (Fig. 3:18), made of well- levigated clay, is vertically hand-burnished on the body and neck. It is characterized by micaceous argillaceous clay, rich in iron oxides and some fine quartz grains. The petrography suggests a possible origin in Cyprus or northern Syria. The juglet has different proportions than the locally produced dipper juglets; its body is smaller and slightly broader and it has a more squared off shoulder. 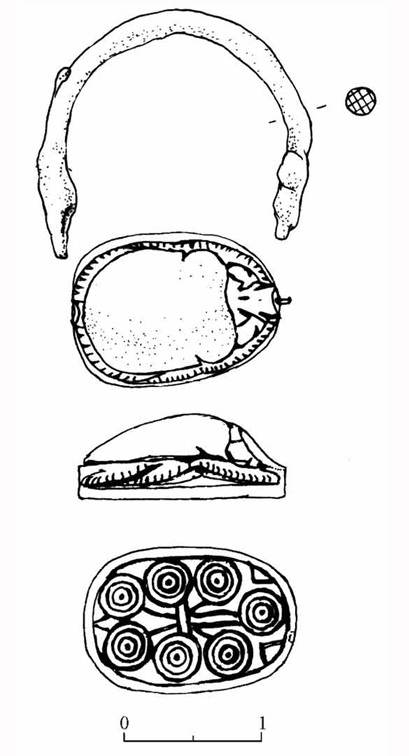 The scarab, made of bone, is decorated on its base with a pattern that appears seven times and consists of three concentric circles with a dot in their center (Fig. 4). Six patterns are arranged in pairs and the seventh pattern is at the end of the decorated area. A double line connects the center pair of patterns and thin lines attached to it connect to the other patterns. On either side of the two end pairs of patterns are incised triangles on the line that delineates the decorated area. This decorative pattern appears for the first time on elliptical seals from the First Intermediate period in Egypt and was rarely used in the Twelfth Dynasty. Its reappearance occurs on scarabs manufactured in the Land of Israel in Middle Bronze IIB, having been inspired by Egyptian glyptic art from the years 1750–1550 BCE. The scarab from Jatt should be ascribed to this period of time. 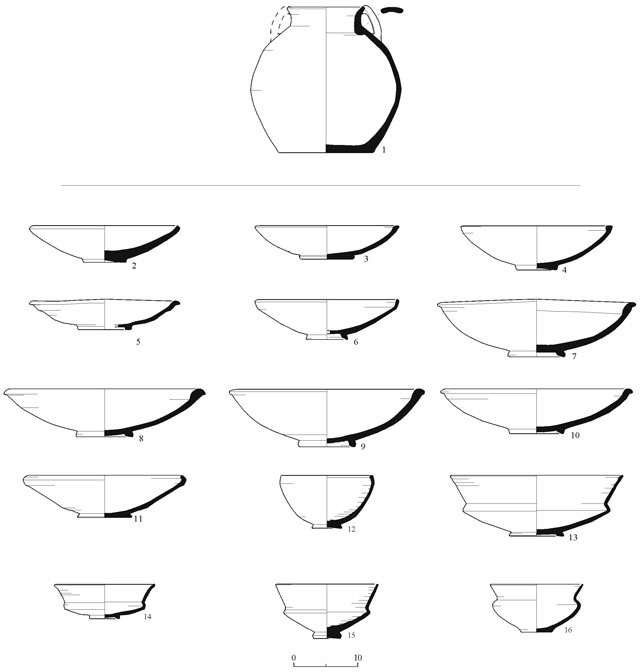 The ceramic assemblage from the tomb at Jatt is analogous to other assemblages that were discovered in Jatt (‘Atiqot 37:1–78) and in tombs near Khirbat Yamma (Eretz Tsafon: 91–106), located 3–4 km from Jatt. The adjacent settlements produced pottery vessels that are almost identical in their form, materials and in the production and finishing techniques they utilized. The tomb was damaged and the assemblage is incomplete, yet it probably comprised two burial phases, the EB IV and MB IIB periods. The EB IV amphoriskos may indicate earlier use of the tomb, but it was probably put into the tomb in secondary use during the MB IIB. The finds from MB IIB form an assemblage of funerary offerings that was characteristic of the period and usually included a variety of bowls, jars, jugs and juglets. The scarab is also a familiar item in tombs of the period. Distinct differences were noted between the locally produced vessels and the group of especially fine quality juglets imported from the Syrian/Lebanese coast. This information supplements the growing amount of data, concerning the juglets’ trade from the Syrian and Lebanese coasts to the Land of Israel. 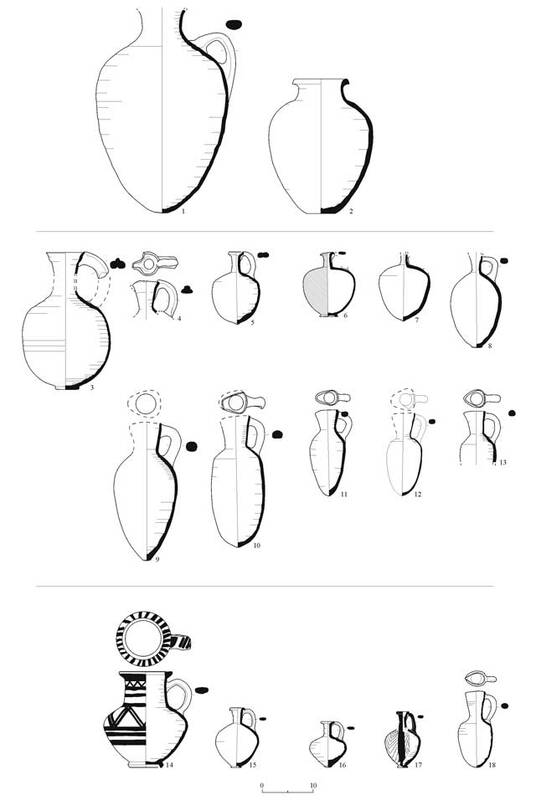 The juglet is a characteristic burial offering in the Land of Israel and until now, imported juglets from the Syrian/Lebanese coast have only been found in tombs. It can not be determined if the juglets were solely traded for use as funerary offerings in tombs. 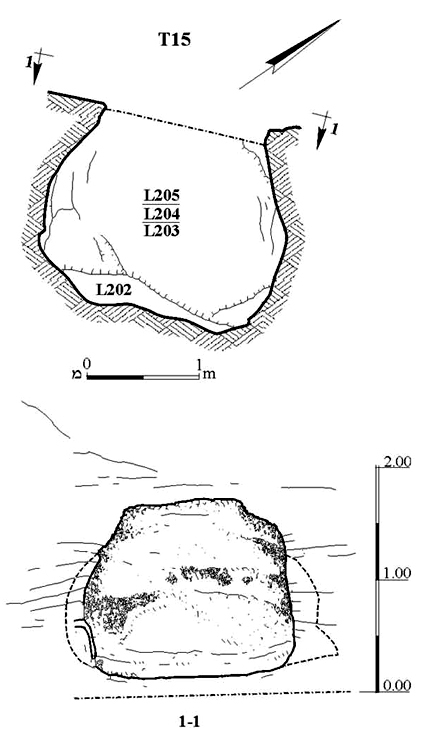 Petrographic analysis of juglets from settlement strata will confirm or contradict this assumption. 2. Pottery: amphoriskos and bowls. 3. Pottery: jars, jugs and juglets.